The Snowposium trade show and conference is set to bring top suppliers and industry leaders together at the Landscape Ontario home office in Milton, Ont., on Sept. 28. The event features a conference and outdoor demos, and displays of some of the latest equipment and technologies for the snow and ice management industry. Snowposium will offer networking opportunities and educational programming focused on real-world business issues including managing risk, product innovations, insurance, cost control and slip-and-fall claims. Registration and a schedule of events is available at snowposium.ca. For more information contact Amy Buchanan, amy@landscapeontario.com or (800) 265-5656 ext. 2329. For exhibit space contact Darryl Bond, darryl@landscapeontario.com or (800) 265-5656 ext. 2366. North America’s professional association for snow contractors, the Snow and Ice Management Association (SIMA), held its annual Symposium in Montreal in June. An impressive contingent of delegates attended the four-day event, which featured on- and off-site education sessions, a trade show, keynotes and an awards evening. This year’s symposium was SIMA’s 20th such annual event, and its first-ever outside the U.S.
Canadian participation was strong among attendees, speakers, sponsors and exhibitors. Bob Wilton, founder of Markham, Ont.-based Clintar Landscape Management, received SIMA’s Lifetime Achievement Award. SIMA’s Cheryl Highley said, “I love Bob. He served on the SIMA board for six years, and he is so proud of his family.” The award is not presented every year; Wilton’s announcement produced a standing ovation. 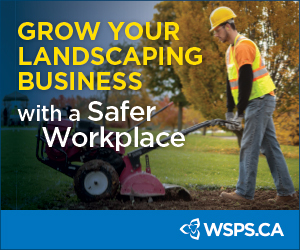 In more Canadian recognition, David Lammers of Garden Grove Landscaping, Waterdown, Ont., received awards for Business Excellence and Safety. The annual event highlights SIMA’s commitment to education. Board chair Justin Gamester announced membership dues have been structured to include a $200 training credit. John Schroeder, founder and CEO of the Valleybrook Group of companies, announced the sale of Valleybrook Gardens, located in Niagara-on-the-Lake, Ont. The company was purchased by Brookdale Treeland Nurseries, a family-owned corporation headquartered in Schomberg, Ont. This transaction affects only the Ontario-based Valleybrook nursery; the original nursery in British Columbia continues to be owned and operated by the Schroeders. Heritage Perennials, Jeepers Creepers, Colour Craze and Garden Gladiators are some of the plant brands which both the B.C. and Ontario nurseries produce under license from Valleybrook International Ventures. Valleybrook Gardens Ontario will continue to produce and sell these products under license to independent garden centres going forward. CanWest, Western Canada’s premier horticultural trade show, is set to bring green professionals and suppliers together Sept. 27-28 at Tradex, Fraser Valley Trade and Exhibition Centre, in Abbotsford, B.C. The educational program features design workshops, a dry stone course, an urban forester’s symposium and a tour of landscapes in the Fraser Valley. The trade show floor will be highlighted by a new product showcase, a greenhouse zone and new plant introductions from the province. For more information and registration, visit canwesthortshow.com. The Landscape Gardening category had a record number of competitors at the 2017 Skills Canada National Competition (SCNC) held in Winnipeg, Man. in May. Eight teams represented British Columbia, Alberta, Manitoba, Ontario, Quebec, Nova Scotia, New Brunswick and Team Canada. This forum is the only national, multi-trade and technology competition for students and apprentices in Canada. The competition saw over 10,000 visitors gather at the RBC Convention Centre in downtown Winnipeg. Winning Landscape Gardening teams were, Gold: Adrian Sinke and Raymond de Kok of Alberta; Silver: Marie-Ève Brodeur and Vincent Pelchat of Quebec; and Bronze: Diana Davidson, Calum MacRae and Zachary Walsh of Nova Scotia. Sponsors Dynascape Software, Hank Deenen Landscaping and The Investment Guild contributed financial support that allowed awards to be given to all medalists, as well as a free certification exam. Over $4,000 was awarded to participants, including a $1500 sponsorship to Team Canada to support their training for World Skills 2017. The 2017 Communities in Bloom National Symposium on parks and grounds and national and international awards ceremonies will celebrate Canada 150 Sept. 13-16 in Ottawa and Gatineau. The event will feature tours of parks and gardens in the region, an awards ceremony and a symposium. For full details, visit communitiesinbloom.ca. Toronto Botanical Garden (TBG) has unveiled an expansion proposal developed by landscape architect W. Gary Smith, along with PMA Landscape Architects with the participation of renowned garden designer John Brookes. The proposal ties together the present four-acre TBG and the adjacent Edwards Gardens, with its parkland and ravine. Features of the proposed expansion include an arboretum, space for community events and teaching gardens, reflecting education as a top priority of the plan. The theme for the 2018 Canada Blooms festival is “Let’s Go To The Movies,” in celebration of the grandeur of the silver screen. “From days of old to the newest blockbuster hit, Canada Blooms is excited to kick off the spring gardening season by showcasing our theme — ‘Let’s Go To The Movies.’” The festival is inviting landscape architects, design/build experts and floral artists to let their imaginations run wild to come up with unique and innovative interpretations of the theme. Canada Blooms 2018 takes place at the Enercare Centre in Toronto, March 9-18, 2018. The Outdoor Power Equipment Institute (OPEI) has named Chuck Bowen as vice president, communications. OPEI is an international trade association representing more than 100 power equipment, engine and utility vehicle manufacturers and suppliers. Bowen was formerly with Lawn & Landscape magazine. Case Construction Equipment celebrated the 175th anniversary of Racine Threshing Machine Works, opened by Jerome Increase Case in Wisconsin. Since 1842, the company has been a part of major innovations in the construction equipment industry, including the introduction of the first portable steam engine in 1869, which led to the birth of road construction, and the launch in 1957 of the industry’s first factory-integrated tractor loader backhoe. Dvorak, the Czech-based manufacturer of the Spider range of remote-controlled slope mowers, has launched its first global social media campaign featuring a giant version of Leonardo da Vinci’s famous Mona Lisa portrait, mown on a hillside at Dolní Kalná in the Czech Republic. The portrait, on a grass canvas measuring 200 by 250 metres with a gradient of 45 degrees, was created over a period of three days: two days of detailed surveying and one day mowing, using the company’s Spider 1 and Spider 2 mowers. It was filmed with drone technology by the motion picture and digital agency, Mustard, based in Prague. A scale drawing of the famous portrait was used to transfer reference points to the hillside using laser surveying technology and then the skilled Spider operators, including the company’s Managing Director, Lubomir Dvorak, mowed the 50,000 square metre image taking direction from the video producer.